www.petergayed.com -- made from scratch! with plenty of vitamin L -- it's good for you. splatter! magazine: splatter! magazine is an undergraduate organization at yale that has been conducting creative writing workshops in new haven middle schools since 1989. each semester, their volunteers gather all the work from the young authors and publish a literary magazine which showcases the creative goodness of grades 5 through 8. like most student websites, splatter's original webmaster was long gone, and the site was left to suffer a slow, agonizing death. for this project, we transfered the original, important content of the old site onto a shiny-new WordPress-powered site. after some brief training, the student coordinators quickly embraced the WordPress interface and things are on the up and up. another happy Internet ending. 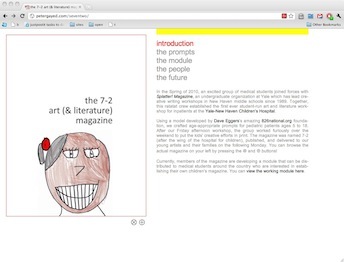 the 7-2 art (and literature) magazine: in the spring of 2010, an excited group of medical students joined forces with the splatter! folks from above to bring the first ever student-run creative workshop to inpatients of the yale-new haven children's hospital. using a model developed by dave eggers's amazing 826national.org foundation, we crafted age-appropriate prompts for pediatric patients ages 5 to 18. after the friday afternoon workshop, the group worked furiously over the weekend to put the kids' creative efforts in print. the magazine was called 7-2 (after the wing of the hospital devoted to school-aged and adolescent patients), published, and delivered to our young artists and their families on monday. currently, members of the magazine are developing a module that can be distributed to medical students around the country who are interested in establishing their own children's magazine. first aid for the usmle step 1 (2010): the life and the light for every medical student prepping for the step 1, now in its 20th edition. this little gem is the best-selling review book for the usmle step 1, the first of three licensing exams taken by M.D. candidates. in the first month of its release (january 2010), the 20th edition sold more copies on amazon.com than president obama's the audacity of hope. granted, audacity was released a couple months before first aid, but still it's nice to say that you can compete with the president. i would argue, though, that first aid carries more believers today than audacity. sorry mr. president. each year the book is edited and updated by 2nd year medical students at the Yale School of Medicine. i took care of the microbiology section, making routine corrections and changes to reflect the changing content of the USMLE Step 1 exam. by the end, i contributed a total of five original tables which reviewed maternal-to-fetal infections (the so called "ToRCHHeS" group), red rashes of childhood, infections in HIV-positive adults, infections in unimmunized children, and infections caused by various strains of Escherichia coli. hope our readers found them useful in their studies! first aid for the basic sciences, 2/e (forthcoming): for this book, i worked on the third and final part of the biochemistry chapter (pp 179—240), which was mainly concerned with principles of genetics, biochemical and molecular assays, hemoglobin biochemistry, metabolism of heme and the porphyrias, functions of the endocrine and exocrine pancreas, fatty acid metabolism, starvation versus fed states, and other inherited metabolic disorders (mucopolysaccharidoses, sphingolipidoses, and hydroxylase deficiencies). in the end, i contributed just over 10 pages of original text, much of which focused on conceptually recasting metabolism by considering the effects on "the four metabolic organs": brain, muscle, liver, and fat. by explaining metabolism this way, i hoped to make clear the "metabolic priorities" of the body and how the body relies on different substrates (glucose verus ketone bodies versus amino acids) in different disease states. in addition to the 11 pages, i also contributed five original tables, five original figures, and 15 new margin notes. again, hope it makes for a better book—happy studying! 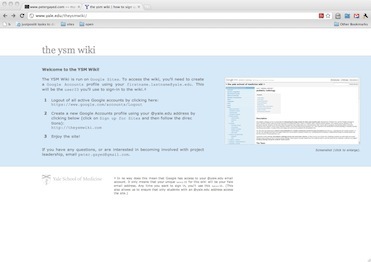 the yale school of medicine wiki: perhaps our most impressive project yet—the ysm wiki hopes to be the one-stop shop for all student advice, guides, note templates, board study schedules, funding tips, study spots, vacation ideas, etc., for kids at yale med. the site is currently run on Google Sites and, at the moment, only open to medical students with a valid @yale.edu address. but if you want to take a gander, or find out how you can implement your own, feel free to email. an online essay in evolution and medicine: this web page was created to fulfill the final paper requirement for EEB 535: evolution and medicine, taught by the evolutionary biologist stephen stearns. i was tired of the clunky, stall-prone temperament of my version of Microsoft Word (2003! ), and at some point in my life i just began to find composition in an html / css editor far more smooth (and maybe soothing), especially when dealing with images. i've also long yearned for more web composition in standard university courses (no doubt due to metaspencer's ENGL 482 i took as an undergrad at illinois). the idea is that writing becomes much more engaging when connected, available, and on display. student work, of any media, always reaches a higher quality when the author knows it will be presented outside the classroom—that is, when it has relevance beyond a semester grade. when my technical skills improve (and i become a less lazy human being), i'd like to write a web application that allows students to create online academic essays like the one i've made here. if you're interested in this sort of idea, email me! if you want to hear more of the same, check out the project description for agonistai below. 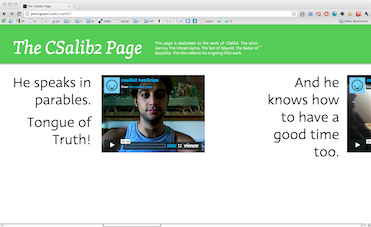 the csalib2 page: this was my graduation gift to one mr. csalib2. the site is dedicated to his life's work and unsurpassable stupidity. among other names, he has been known as The Idiot-Genius, The Inbred Llama, The Son of Maurid, and The Savior of Stupidity. the site itself employs a combination of basic HTML, CSS, vimeo embeds, soundcloud, typekit font families, and the LightBox 2 script. enjoy! happy graduation, mr. csalib2!! 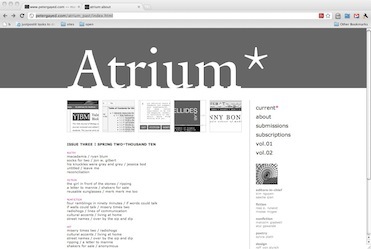 the atrium magazine: the atrium calls itself "this generation's professional healthcare magazine." housed at the yale school of medicine, but showcasing the work of students of medicine from across the country, the magazine is the online hub for all varieties of reflection on and critiques of the medical enterprise. find here stories, essays, interviews, poems, photographs, satire, music—in a word, narratives—that take "the industry of healthcare and the experience of illness" as their subject. for this project, we took an old static version of the site i first developed during my first year of medical school (this one, right here, and later this one) and gave it the power of WordPress (thank the heavens for WordPress!). in addition to its usual annual printed form, the magazine now lives and breathes a dynamic existence, with content coming from multiple authors, mainly at the yale and the stanford schools of medicine. interested in contributing? head right over to the site, and click on submissions. agonistai—a real link coming soon! an undergradute journal of comparative literature at the university of illinois. project description goes something like this: "Agonistai was borne out of the idea that undergraduates produce their best work when there is a public space in which to show it. When student writing becomes more than a means to a letter grade—and when it is made available to eyes beyond the student and her instructor—writing, analysis, and interpretation take on greater meaning and insight." a delicious.com link list of various experimental methods, with annotations! hello! my name is pete and this is my official web dwelling. i am an M.D. and immunology Ph.D. student at yale planning for an academic career in pediatrics. i enjoy learning about the web and web design, and how tools on the internet can make us better students, doctors, and researchers. 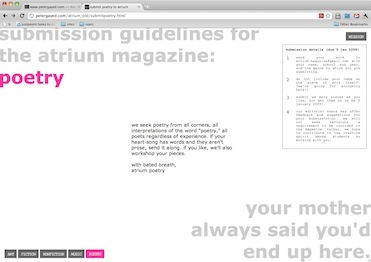 i first created this site in 2007 to collect my web projects (and other enjoyed web bits). so far it has undergone five revisions, which you can find here: 1/e, 2/e, 3/e, 4/e, 5/e. more change ahead! 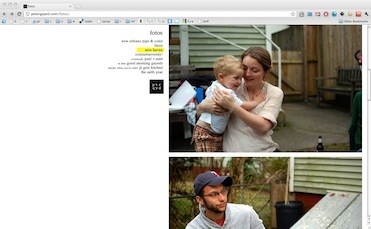 this website (and most everything else on the web) is best viewed in firefox—save the Internet! now! pull yourself up with these bootstraps.